Growers have been successfully growing on substrates for decades. From the nineties onwards, coir-based growbags were introduced by several manufacturers, with varying success. At first, there were issues with the lifespan of the plastic, and the coir bags were considered too wet. However, the Sri Lankan and Indian plastics industry improved the quality of the plastic and increased its reliability. We are now able to guarantee the lifespan of the plastic for years to come. Recent product developments have also made growbags coarser and airier. 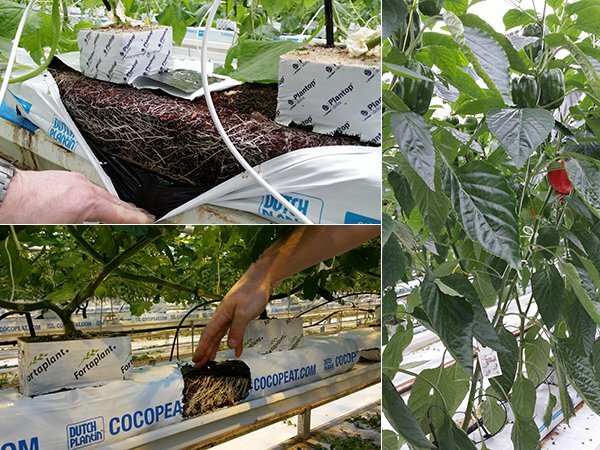 Between 2008 and 2011, we developed a new generation of Double Layer growbags, with coarse coco pith on top (for fast taking of the crop and a perfect horizontal rooting) and coco chips on the bottom (for uniform and easy drainage). We are now able to ensure even more air (or ‘less water’) at the bottom of the bag than at the top! Plants perform better on such generative substrate, and the other way around. Our customers/growers are able to manage this system perfectly and easily. Coir-based growbags are the world’s standard for growing in soil. We have noticed increased interest in our growbags in the Netherlands, and several trials have been started. While our growbags have proven their quality time and time again, what with the millions that have been sold, we understand growers’ desire to see the results for themselves first, in their very own greenhouse.